Often descended from former kingdoms and duchies from the Middle Ages, the UK’s various counties have different roles depending on their nation. In essence though, the counties today exist for the sake of making administrative and geographical distinctions. The UK isn’t a large country, but there are often tangible differences from county to county, in terms of heritage, culture, landscape and climate. Browse through to find the place that sounds perfect for your special day. 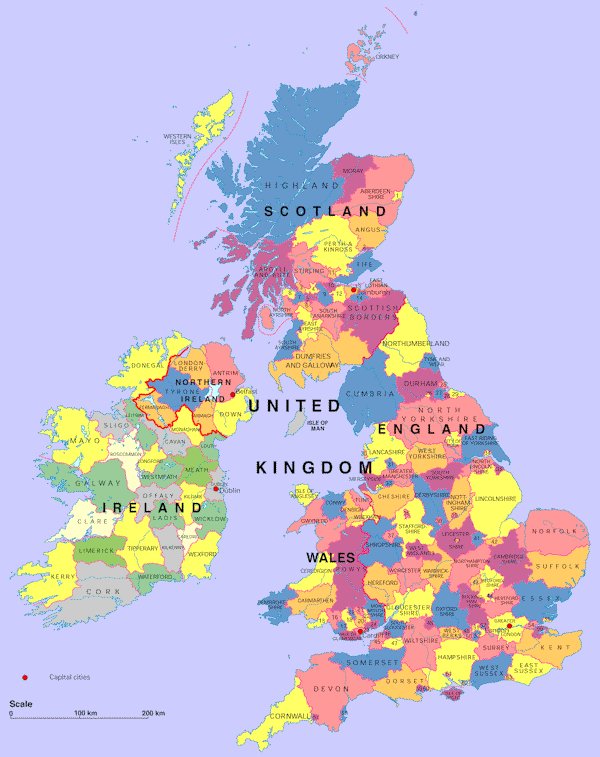 In Scotland the historic county system has been replaced by administrative subdivisions. Set in the East of England, Bedfordshire is largely made up of pastoral farmland. The two main towns are Luton and Bedford, which are both within an hour’s drive or train ride of London. A must-see here is the palatial 18th-Century country house, Woburn Abbey, seat of the Duke of Bedford and complete with beautiful gardens. On site is the large Woburn Safari Park. You don’t need to be a historian to admire the elegant Georgian architecture of the village of Woburn nearby. Just west of Greater London, Berkshire’s most famous town is Windsor, home to the eponymous royal castle, dating to the 1000s making it the longest-inhabited palace in Europe. Windsor is the twin town of Eton, known for the UK’s most prestigious public school, where generations of British politicians were educated in their youths. Ascot Racecourse to the southeast of Berkshire is one of big names on the horseracing circuit, rounding off a thoroughly upmarket wedding destination. A city with a proud seafaring heritage, Bristol is admired for its 18th and 19th Century architecture. It is also associated with the famous engineer Isambard Kingdom Brunel, who left his mark on the city in the shape of the pioneering Clifton Suspension Bridge, which was completed in 1864. On the same theme, you can also visit the SS Great Britain, Brunel’s iron-hulled ship dating to 1843 and preserved in dry dock. A “Home County” and favoured by commuters working in London, Buckinghamshire is notable for its large Area of Natural Beauty, the Chiltern Hills. The highest point of this chalk escarpment is 267-metre Haddington Hill close to Wendover. The county is dotted with stately homes, historic gardens and rural countryside, but is also where you can find the “new town”, Milton Keynes, with a population of more than 200,000 and only taking shape in the 1960s. A flat county associated with agriculture, Cambridgeshire is in the East of England and gets its name from Cambridge. This city is celebrated for its distinguished and historic university, among the most famous in the world. The university’s various semi-independent colleges exhibit a variety of handsome architectural styles, and their gardens “The Backs” provide a lovely green buffer between the colleges and the River Cam, perfect for wedding snaps. Contrasting with the industrial cities just beyond its boundaries, Cheshire is an idyllic rural county in the Northwest of England, made up mostly of farmland and a lovely place to tie the knot thanks to its many picturesque villages. There’s plenty of Roman history here too. The beautifully preserved city of Chester was once one of ancient England’s largest military bases, and surviving fragments from this time include defensive walls, an amphitheatre and Roman gardens. Found on England’s extreme southwest tip and surrounded on three sides by water, Cornwall’s remoteness has helped it cultivate an identity unlike anything found elsewhere in the country. Firstly it’s not even strictly a county, but a Duchy. The Cornish people are also proud of their Celtic heritage, with their historic language making a comeback in recent years. The landscapes inland are of wild moors and granite hills. On the coast the beaches and seafront are magnificent, and the county has long been favoured as a summer getaway for the English. England’s most northwesterly county; Cumbria is also one of the most sparsely populated places in the entire UK. It is a favourite wedding destination thanks to its inspiring natural scenery. The Lake District National Park here is a big expanse of woodland, mountains known as “fells” and the largest bodies of water to be found in England. It’s a mecca for walkers, climbers, watersports enthusiasts, as well as couples looking for a beautiful backdrop for their wedding. Cumbria is also on the Irish Sea, and features one of Roman Britain’s most important structures - Hadrian’s Wall, built to defend England from the northern tribes. This landlocked county in England’s East Midlands has hilly countryside where you can find a host of romantic historic gardens and stately homes. The most recognisable of these is Chatsworth House, which is often listed as England’s favourite country house, having appeared in several films and TV dramas over the years. The natural scenery is often majestic, particularly in the north of the county, which is part of the Peak District National Park and boasts beauty spots like the Dovedale valley. Set on England’s southwest peninsula, Devon is unique in that it has separate northern and southern coastlines. Enjoying a mild climate, it’s a popular summer holiday destination, admired for its beaches, cliffs and coastal resorts on the Bristol Channel to the north, and the English Channel to the south. Recently the north coast has also drawn lots of youngsters for its surfing. Extensive parts of the interior are covered in panoramic moorland, the largest of which is the Dartmoor National Park. In the South West of England, this is a beautiful place to visit to say “I do”. Covered in green farmland, more than half of Dorset is protected as conservation areas. Especially eye-catching is the UNESCO-listed Jurassic Coast, which stretches west from the charming coastal resort of Swanage. It’s a hotspot for fossil hunting, while the towering cliffs and spectacular geological features provide wonderful photo opportunities. Poole is a classic English seaside resort with one of the world’s largest natural harbours. Found in the northeast, County Durham is a part of the country with panoramic landscapes, both inland and on the North Sea. The western part of the county boasts some of England’s highest terrain, and snowfall is a regular sight here in the winter months. On the coast are long, sandy beaches, which are magnificently windswept and untamed. The university city of Durham could be a striking setting for a wedding, with a Norman castle and a cathedral, which together form a UNESCO World Heritage Site. Though occasionally overlooked, Essex is a fine spot to consider for a wedding. Away from the estuary it mixes rural areas with family seaside resorts, but is also easily reached from London and has superb transport links from abroad via Stansted Airport. As an historic port of entry for the East of England, Essex has a wide array of landmarks to visit, including the preserved Roman heritage of Colchester and Hedingham Castle, which has a stone keep that has stayed intact for a millennium. The county of the Cotswold Hills and the River Severn, Gloucestershire is a lovely corner of South West England, on the border with Wales and the scene for many a fairy-tale wedding. The Cotswolds form a large Area of Outstanding Natural Beauty, where there’s a bucolic landscape of gently rolling hills, farms and villages built with the distinctive honey-coloured limestone quarried in the region. Make time also for Gloucester, where there’s a majestic 12th Century Cathedral with gothic architecture that has featured in several movies. Containing the capital and its suburbs, this is an international centre for culture and commerce. Among the sights here are some of the world’s most recognisable buildings and monuments, from Buckingham Palace to Tower Bridge. The range of museums is also top notch, among them the Tates, the National Portrait Gallery and the British Museum with a vast collection of artefacts from all kinds of places and times. London’s West End, focused around Leicester Square and Covent Garden, is a byword for stage entertainment, while shoppers, sports fanatics and live music fans are all spoiled for choice here. This is a densely populated metropolitan county, with two cities (Manchester and Salford) and ten metropolitan boroughs. After the industrial revolution in the 18th Century, the population of this region exploded, as it became the UK’s centre for textile manufacturing. Much of the original 18th Century infrastructure remains, like the impressive Bridgewater and Manchester Ship Canals. The city of Manchester is well known among sports fans for being the home of City and United, and there’s first-rate shopping, lots of culture to experience at Oxford Road as well as the regenerated docks at Salford Quays. On the south coast and definitely meriting consideration as a marriage destination, Hampshire contains the New Forest National Park. This was originally created as a hunting ground by William the Conqueror in 1079 and today is made up of deciduous woodland, farmland and several small villages. It’s a fine choice for horseback riding, walks and bike rides. The cities of Southampton and Portsmouth also have immense significance for the shipbuilding, trade and naval heritages that go back to medieval times. Remote and rural, Herefordshire in the West Midlands was where the Welsh and English met in battle for centuries until the end of the medieval period. This has furnished it with many romantic castles, numbering 130 in total. Hereford is the lovely county town, with quaint half-timbered houses, a castle of its own and a remarkable cathedral dating back to 1079. One of the Home Counties, Hertfordshire is just north of London. It’s known for its many pleasant towns, which tend to serve as suburban homes for commuters. Hertfordshire is the place to say, “I do” if you want all the beauty of the English countryside, but with short journey times to the capital. Essential here is the ancient city of St. Albans, which has its roots in the Celtic era and also boasts Roman ruins. Also well worth seeing are the many stately homes across the county, the standout of which is Hatfield House from the early-17th Century. England’s largest island and the destination of choice for seaside holidays since Victorian times, the Isle of Wight is off the south coast, opposite the cities of Portsmouth and Southampton. Inland it’s a green and peaceful place, great if you’d like a secluded rural spot for your wedding. Here there are small country villages and interesting monuments like Carlsbrooke Castle. On the coast are the genteel resorts that first attracted the Victorians, a prime example being Ryde, which has a Blue Flag beach. This county extends from southeast London out to the southeast coast of England. Kent is often referred to as the “Garden of England” and has plenty to recommend it, both for its rural scenery and rich historical interest as the UK’s gateway to Europe. On the coast you can see the iconic White Cliffs of Dover and inland you can explore cities like UNESCO-listed Canterbury, known for its medieval and Tudor architecture. Of the many fortresses in the county, Leeds Castle is perhaps the most charming and a favourite for couples tying the knot. Located in North West England and a county of great variety, Lancashire has fascinating industrial history, some of England’s most famous seaside resorts and also lots of attractive rural moorland to see. The best-known tourist destination here is Blackpool, a glitzy and fun-packed location for a wedding. Here there are beaches, pleasure piers, the iconic tower and famous illuminations. For heritage, explore the many small mill-towns in the county or head for Lancaster, which has a stunning castle and historic links to the British monarchy. This East Midlands county is one of the most ethnically diverse outside Greater London. There’s a large South Asian community here, which lends the area a colourful backdrop and has given rise to fabulous cuisine. Leicester is among the best cities in England to enjoy a curry. The town of Melton Mowbray has its own culinary speciality in the shape of its Stilton cheese and pork pies. History buffs know the county as the site of the Battle of Bosworth Field, the epoch-defining face-off between the Houses of Lancaster and York, where Richard III met his end. One of England’s largest counties but also among its most sparsely populated, Lincolnshire is on the east coast and has a strong agricultural character. Visitors love it for its numerous National Trust and English Heritage properties, including the beautiful Tatershall House from the early 1400s. Being a low-lying county, windmills are a common sight in Lincolnshire and add to the rustic charm of the county. Many of these are now preserved as museums. On the coast meanwhile are a great many sandy beaches, four of which are Blue Flag-commended. Within this metropolitan county is Liverpool, which expanded rapidly in the 19th Century to become one the world’s largest ports. In modern times it is perhaps best known on the international stage for the Beatles, whose contribution to popular music is immeasurable. At the Albert Dock the Beatles Story Museum recounts the history of the band. For art lovers, Tate Liverpool is a must, while the World Museum has fine collections of any field from aeronautics to Egyptology. This is a flat county in the East of England, traditionally known for its farming and agriculture. Norfolk has a long coastline on the North Sea, home to classic English seaside towns such as Great Yarmouth with its piers, amusements and beaches. Nature lovers should make for the Broads National Park, where there’s a large network of rivers and lakes, most of which are navigable by boat. En route are countless beauty spots and plenty of friendly rural pubs to stop at. A county with industrial traditions, there are interesting vestiges of Northamptonshire’s past all around. One preserved remnant is the Grand Union canal, which runs through the county and is now maintained strictly for pleasure. Holidaymakers hire barges to see the countryside and explore sights from the Industrial Revolution, such as the 2.8-kilometre-long Blisworth tunnel, built in the early-1800s. Motor sport fanatics could time their ceremony to coincide with the British Grand Prix, held at Silverstone in this county. Romantically wild and rugged, with a landscape steeped in history, this county in England’s far North East is ideal for a picture book wedding. Wherever you go there’s something special to see; the North Sea coast and its long deserted beaches; Hadrian’s Wall, just one of many landmarks conveying the region’s tumultuous history at the border between England and Scotland. Away from the coast is the Northumberland National Park with high moorland, woods and lakes, and a complete absence of any development. The northern part of this county is where the famous legend of Robin Hood originated. Sherwood Forest has a visitor centre and a host of sights relating to the tales, including the thousand-year-old Major Oak. The city of Nottingham also has strong connections to this folklore and is packed with interesting things to see. You could visit the City of Caves, a man-made complex of underground chambers carved from the sandstone, or Nottingham Castle, a handsome stately home complete with a statue of Robin Hood. Bisected from west to east by the meandering course of the Thames, Oxfordshire is a county of idyllic farmland, picturesque villages, and is of course where you’ll find the city of Oxford and its renowned university. A significant part of the county is inside the charming Cotswold Hills and there can be few better backdrops for a rural wedding in England. Oxford is a must do, with its beautifully presented college buildings, riverside activities and wide variety of interesting museums and galleries to check out. A very small and rural county in the East Midlands, Rutland has a landscape of undulating farmland and small villages with old limestone cottages. There are several country homes and gardens to visit, as well as the large reservoir, Rutland Water. This is a panoramic spot with abundant birdlife and opportunities for boating and cruises. In the West Midlands, Shropshire was one of the places where the Industrial Revolution took hold in the 18th Century, and as such is filled with cultural interest, which complements the scenic beauty of the setting. The UNESCO-listed Ironbridge Gorge exemplifies this harmony between the natural and man-made. Sights include blast furnaces, old mines, railway lines and the famed bridge at Ironbridge, the first in the world to be built from iron. The lovely county town of Shrewsbury was the birthplace of Charles Darwin, and has more than 650 listed historic buildings. When it comes to rural idylls, few places compare to Somerset in the South West. The scenery is of green rolling hills and farms where some of England’s favourite foods are cultivated, like cheddar cheese and cider. If you want untamed landscapes in your wedding pics then the Exmoor National Park is made up of wild heaths and moors, grazed by sheep and where the famous Exmoor ponies roam free. For culture and history look no further than the city of Bath, replete with elegant Georgian architecture and Roman heritage. With hilly scenery in the north and south, and attractive rolling countryside in the middle, Staffordshire is an attractive West Midlands county that offers Victorian Industrial history and plenty of medieval interest too. Handsome Lichfield was the birthplace of the famous 18th-Century writer Samuel Johnson, and is all the more romantic for its beautifully preserved heritage that includes the only cathedral with three spires in the world. Stoke-on-Trent flourished in the 19th Century for its potteries, a number of which still operate today. A fertile county in the East of England, popular for its pretty villages and inviting coastline, Suffolk has always been seen as a desirable wedding location. The North Sea Coast has towns like Felixstowe, which was established in Victorian times and has the classic promenade next to a beach lined with painted huts. In the countryside are gorgeous medieval market towns like Newmarket, where England’s first racecourse was set up in the 17th Century, and Bury St Edmunds, where the ruins of a monastery destroyed during the reformation, can still be seen today. Southwest of Greater London, this county has a reputation for affluence, and many of its residents work in London thanks to the swift commuting times. With a quick glance at Surrey’s towns and villages it becomes clear why the wealthy choose to live here. Guildford is packed with marvellous old architecture, including the Tudor Guildhall and medieval Castle. You could tie the knot by the leafy riverside at Kingston-upon-Thames or in Farnham, a fascinating place with an abbey and castle that remained intact since Norman times. For outdoor scenery, make for the undulating chalk hills, the North Downs. This county on the south coast mixes arresting natural scenery, historical importance and a coastline with some of England’s top seaside resorts and beaches. Brighton is an undoubted highlight - progressive and trendy, with a character quite unlike anywhere outside London. The South Downs National Park is the place to go for breathtaking wedding snaps. These tall chalk hills offer far-reaching views of the rich, green countryside. Sussex has more world-class heritage than can be listed here, with epoch-defining battlegrounds, fairytale castles, towering cathedrals and a whole host of Roman ruins. Within this county are two cities, Newcastle and Sunderland. Both played a key role in the Industrial Revolution of the 18th and 19th Centuries. In Newcastle Grainger Town is a beautiful district laid out in the mid-19th Century and altered little since then. The Central Arcade meanwhile is a beautifully presented iron and glass shopping arcade from the late-19th Century. Neighbouring Sunderland was the heart of England’s glassmaking industry, which you can find out about at the Sunderland Glass Museum. A West Midlands county with strong literary connections, Warwickshire was the birthplace of William Shakespeare and the groundbreaking 19th-Century female author George Eliot. Stratford-upon-Avon, which will forever be associated with The Bard, has an abundance of half-timbered Tudor buildings. There can’t be many more romantic settings for a wedding. The county town of Warwick is just as beautiful, with quaint medieval buildings next to cobblestone streets, and featuring one of the UK’s most spectacular castles. This county holds England’s second largest city, which was a key centre for industry in Victorian times. In the Second World War it was practically levelled, and since then has acquired a reputation for its modern architecture. A fine example is the Bullring, a shopping and entertainment complex remodelled at the start of the 21st Century. Birmingham is known for its shopping and nightlife, but there are plenty of museums too, the Barber Institute, which has a great collection of 19th-Century pre-Raphaelite painting. If you dream of saying “I do” in pastoral countryside, where thatched cottages nestle in green vales then Wiltshire in the West County would be a top pick. The scenery here is of gentle chalk hills and arable farmland. It’s a place of legend too, and the seat of Iron and Bronze Age kings, who ruled the land several thousand years ago. The best remaining evidence from these times can be seen at Stonehenge, the internationally renowned monument. The city of Salisbury is also a must - the view from the top of the 13th-Century cathedral is astounding. A quiet county with no cities, Worcestershire is in England’s West Midlands. The countryside is beautiful, particularly to the west where you’ll find the Malvern Hills formed of some of the most ancient rocks in the UK. These hard, nonporous rocks create the appropriate conditions for England’s purest spring water. The county town of Worcester, once a Roman settlement, is famed for its stunning cathedral as well as being the birthplace of Edward Elgar. Midlands Road is also the home of the well-known Worcestershire Sauce, brewed here since the 19th Century. Covering a large part of northern England, Yorkshire has something for all-comers. On the North Sea are lovely seaside resorts like Scarborough, celebrated for its mineral spa and sandy beaches. To the south of the county are modern urban centres like Leeds and Sheffield, full of old industrial buildings from the 18th and 19th Centuries. Medieval history is represented by the countless churches, and historic abbeys such as Whitby and York Minster. And if you’re in need of unspoiled landscapes, head north to the Yorkshire Moors and Yorkshire Dales, or south to the Peak District. Harrogate, with its historic buildings, natural springs, amazing hotels and restaurants and delightful shopping, is also the perfect destination for a wedding. With an alluring mix of rugged scenery, natural wonders and preserved history, Antrim is a beautiful place to consider for your wedding. Unmissable is the Giant’s Causeway UNESCO World Heritage Site, where there are more than 40,000 interlocking basalt columns from a prehistoric volcanic eruption, creating an unforgettable scene. There’s no end of historical interest in the county, from the ancient cairns (ancient tombs) scattered across the landscape to romantic castles like Carrickfergus, dating to the Norman invasion. The Glens of Antrim are a series of nine green valleys, revered for centuries for their natural beauty. Historically associated with Northern Ireland’s troubles, Armagh has been peaceful for the best part of two decades. It’s a charming county, full of rich greenery and with lots of nature and history to enjoy. Walkers should make for Slieve Gullion, an extinct volcano with a crater lake that features heavily in Irish mythology and has two 5,000 year-old cairns. The city of Armagh is proud of its heritage, which includes St Patrick’s Cathedral, founded all the way back in the mid-5th Century. A coastal county known for its unspoiled beaches, County Down is where you’ll find the elegant coastal resort of Bangor, Northern Ireland’s third largest town. It is often rated as one of the country’s most desirable places to live thanks to its lovely architecture, gorgeous natural scenery and comfortable microclimate. The Ards Peninsula is ideal if you’re in need of invigorating coastal walks and welcoming pubs and restaurants. Crawfondsburn and Donaghadee have old inns that have been in business since the early-17th Century. Peaceful and rural, County Fermanagh is visited for its lakes and natural scenery. Lough Erne covers a great deal of the county’s area, and is especially picturesque, overlooked by Enniskillen Castle and favoured for its great fishing and water sports. Enniskillen has lots of friendly pubs and restaurants, and just outside the town is Florence Court, a lovely 18th-Century National Trust property, seat of the former Earls of Enniskillen. The Marble Arch Caves near Florencourt also warrant a mention - they sit 100 metres underground and are said to boast the most impressive karst formations found in the UK. Londonderry is on Northern Ireland’s northern tip, with an Atlantic coastline. One of the best places to enjoy the ocean is from Mussenden Temple, which is perched atop a cliff overlooking the unspoiled Downhill Strand and the Atlantic beyond. The city of Derry is essential too, not least for its 17th Century city walls, which are perfectly preserved making it unique in the whole of Ireland. The market town of Coleraine might also serve as the ideal location to tie the knot - it sits on the fringe of the beautiful and culturally significant Mountsandel Forest. A county of natural splendour to the west of Northern Ireland, Tyrone encompasses a large swathe of the Sperrins, tall green hills formed by ancient glaciers. Sawel Mountain is the highest point, at 678 metres and is popular with hill walkers. Cookstown is in the Sperrins and is where you’ll find the Ardboe Old Cross and St. Colman’s Abbey, dating back to the 900s. There’s also lots of folklore to delve into - Tullyhogue Fort is atop a large mound to the south of Cookstown and was an important ceremonial site for several centuries in the Middle Ages. The various descriptions of Aberdeen give you some idea of its grandeur and splendour; the Granite city, the Grey City and the Silver city with the golden sands. Aberdeen became a Royal Burgh in the 12th century with Old Aberdeen being in the location of the original settlement from around 8000 years ago. The architecture of this extraordinary city literally sparkles; from the Victorian granite buildings to the Powis Gate in Old Aberdeen there are many beautiful and imposing backdrops for a truly memorable wedding. Rich in history from as far back as the Bronze Age, Aberdeenshire is as naturally picturesque as it is architecturally interesting. There’s rocky, rugged River Dee with its glorious waterfalls running through the Cairngorms National Park; or the River Don, which flows gently from Glen Avon to the North Sea. The countryside is littered with ancient lime kilns and even older cairns while Aberdeen, also known as the Granite City, has been a human settlement for at least 8000 years and today boasts some splendid and imposing Victorian architecture, mixed with much older stone buildings. The scenery in Angus is split into three definite areas; mountainous in the Glens, undulating hills closer to the sea, and green valleys with agricultural land for both soft fruit and Angus cattle. Arbroath is the largest town and fishing port in the county and is famous both for the delicious Arbroath Smokie and the imposing Arbroath Abbey, which dates back to 1178. Throughout the county you’ll find beautiful villages and hamlets like Bridge of Craigisla on the River Isla and St Vigeans with its eponymous parish church, to name but two, as well as glorious castles. One of the borders of Argyle and Bute runs right through Loch Lomond of the ‘High Road and Low Road’ fame, which gives some idea of the varied and interesting scenery found here. There are highlands, lowlands, islands, rivers, castles, national parks, picturesque towns, quaint villages and any number of lochs or lakes. Take a look at Carrick Castle on the west shore of Loch Goil or Kilmartin Glen with its proliferation of Neolithic and Bronze Age remains. Visit the Argyle Mountains or Fingal’s Cave on the uninhabited island of Staffa; the variety here is endless. Found on the southern shore of the Firth of Forth, the City of Edinburgh is the capital city of Scotland as well as a county seat. The historic centre is divided into two, the Old Town and New Town although even the New Town came into being as early as the 1700s. The Old Town sweeps down from Edinburgh Castle, perched on its craggy rock, towards Holyrood House. The New Town and Princes Street are to the north separated from the castle by Princes Street Gardens. This is a spectacular place to hold any event. Clackmannanshire is in the Central Lowlands of Scotland, with its county town, Alloa, on the north bank of the Firth of Forth near the foothills of the Ochils. Although it is Scotland’s smallest county it lives up to its slogan of ‘more than you imagine’ with rolling hills, the tallest of which is Ben Cleuch, Castle Campbell, once visited by Mary Queen of Scots, numerous rivers, seaports, fishing villages and beaches. There are plenty of towns and villages worth visiting not least of which is Clackmannan, named after a pre-Christian monument still found in the town square. A large county located in the western Scottish Uplands, Dumfries and Galloway is probably more famous for weddings than just about anywhere else in the world thanks to Gretna Green. But it has a lot more than just a place to elope to, with beautiful rivers and lochs, three areas of national scenic beauty, castles, abbeys and a number of fascinating towns and villages; there is even a Tibetan Monastery in Eskdalemuir. If you’re interested in wildlife there is also a Wildfowl and Wetlands trust at Caerlaverlrock, one of only nine in the UK. The fourth largest city in Scotland, Dundee is in the eastern central lowlands on the north bank of the Firth of Tay. Although there is evidence that Dundee had been in existence for thousands of years it is from the 12th century onwards that it prospered as a seaport. Known as the city of jute, jam and journalism, Dundee has survived many setbacks, including the decline of the jute industry, but has always come back stronger and better. The architecture is eclectic, from the ancient Claypotts Castle, through the industrial Cox’s Stack to the very modern. Towards the southwest of Scotland, East Ayrshire is quite a small county but has a great deal to offer not least for its connections with Robbie Burns; the first collection of his works was published in Kilmarnock in 1786. Kilmarnock is the largest town and has not just the River Irvine flowing through it but also Kilmarnock Waters. There are five castles in the county as well as a number of stately homes although it you are looking for a backdrop with a difference then visit the Scottish Industrial Railway Centre, which has a number of working steam locomotives. Bordering the north west of the City of Glasgow East Dunbartonshire includes many of the suburbs of Glasgow, as well as a number of commuter towns. Although it is a small landlocked county there is a lot to see, with rivers, canals, fells, and the start of West Highland Way, a footpath, which runs from just north of Glasgow all the way to Fort William in the Scottish Highlands. There is also Mugdock Country Park, which includes what is left of the 14th-Century Mugdock Castle, and the ruins of Craigend Castle built in the 1800s. At the heart of East Lothian is Haddington which dates from the 6th or 7th century and boasts the beautiful Town House at its centre built in 1748 with stunning assembly rooms added a few years later. The county is very varied with rural villages and farmland, seaside towns, fishing villages with long stretches of beach and the truly urban as it touches on the outskirts of Edinburgh. As a backdrop for a wedding there are castles, medieval churches, ancient mills and rolling hills. Covering a very small area which borders on the City of Glasgow, East Renfrewshire has evidence of thousands of years of human settlement; there is an Iron-age fort in Busby and a pre-Roman settlement in Overlee. There is also a lot of history to be found in the area with Cathcart Castle where Mary Queen of Scots stayed before her defeat in May 1568. Sadly the castle is no longer there but there are still many other interesting and historical landmarks like Pollok House and any number of picturesque villages. Falkirk is a small county area to the south of the Firth of Forth but it is home to the largest equine sculpture in the UK, the Kelpies that stand 30 metres tall and pay homage to the tradition of working horses in Scotland. Falkirk has any number of spectacular places for a big day from any of the beautiful, historic or picturesque buildings to acres of green-space, rivers and lochs or, of course, the magnificent Firth of Forth. Bordered by the Firth of Tay and the Firth of Forth, Fife is a peninsula in Eastern Scotland. Kirkcaldy is Fife’s largest town dating from 1075 and today still has a number of quaint old buildings like the Merchant’s House and the Old Kirk Tower. Probably better known is St Andrews on the north east coast, which is home not only to golf but also one of the oldest universities in the world. Fife has interesting volcanic features like the Lomond Hills as well as agricultural land and interesting fishing ports and marinas. Glasgow developed from a small rural settlement on the River Clyde to become one of the largest seaports in the world, the third largest city in the UK and the largest city in Scotland. The architecture is rich and varied from the ultra-modern Glasgow Science Centre to the University of Glasgow which was founded in 1451; from Royal Exchange Square to the Finnieston Crane. Glasgow is an eclectic city, bright lively and young as well as well-established and imposing. Highland is Scotland as we imagine it from literature and legend. A rugged terrain peopled by kilt wearing clans, a land where Bonnie Prince Charlie strutted his stuff, where whisky is distilled and tartans denote family connections. This is where there is skiing in the winter, where ferries run regularly to the islands throughout the summer, where history is in every rock, every castle and every loch. Highland is for hiking, cycling, sailing, climbing and relaxing and don’t be surprised if you recognise landmarks and sights, it’s a place regularly used in films from James Bond onwards. Inverclyde is one of the smallest counties in area, but not so small from the point of view of population. It is one of the many authorities clustered around Glasgow, this time including the Port of Glasgow but without a border with the city. While water is very important to Inverclyde there are also some very interesting inland villages and towns with fascinating features. Take a look at Mount Zion Church in Quarrier’s Village or the quaint main street in Inverkip. If you want water and beautiful sunsets over the sea try Gourock Point or Greenock on the River Clyde. Midlothian borders the City of Edinburgh, the Scottish Borders and East Lothian. Its main city is Dalkeith, an attractive town on the River Esk with a 12th century castle now called Dalkeith Palace. Other interesting buildings in Dalkeith are the Corn Exchange, St. Nicholas-Buccleuch Church and Tolbooth among others. Rosslyn is also beautiful with Rosslyn Chapel perched on a hill overlooking the village; it is considered by many to be the finest architecture in Scotland. In fact, for a relatively small area Midlothian has a huge number of castles, houses, forts and churches worth seeking out. In the north east of Scotland bordering Aberdeenshire and Highland, Moray has a long coastline on the Moray Firth. Elgin is one of the towns in the area famous for its whisky production at Glen Moray Distillery and also for cashmere. The skeletal ruins of Elgin cathedral are very atmospheric. On the water is the little fishing town of Lossiemouth with a beautiful beach, mild Gulf Stream climate, great golf course and a picture postcard lighthouse. The tiny Tomintoul is probably best known for being the highest village in the Scottish Highlands. North Ayrshire is situated in the southwest of Scotland and, as well as the area on the main land along the Firth of Clyde, it includes the Isle of Arran and Cumbrae Isles. The main town is Irvine, a modern city and administrative centre. Interesting and very pretty is Largs, a seaside town on the Firth of Clyde with a traditional pier and historic links with the Vikings. The largest town on the Isle of Arran is Lamash, a mostly white-painted settlement along the edge of the sea. The Cumbrae Isles are holiday islands with world-class golf courses. East of Glasgow, North Lanarkshire was traditionally a centre for weaving, mining and other large-scale industry, none of which still takes place. Nonetheless there are plenty of hints of these former activities, not least the Monkland Canal, which connected the town of Airdrie with the Townhead Basin in Glasgow. The northern part of the region is the most scenic, where you’ll encounter the imposing Campsie Fells hill range. Historically this was a region fraught with danger and a hiding place for bandits. Sitting right on the boundary with England it was also the site of a great many bandits. Today it’s famed for the River Tweed, its beautiful green hills and abbeys, the result of efforts by Scotland’s medieval kings to build up the region. The most famous are Dryburgh, Kelso, Jedburgh and Melrose, all of which are ruined but preserved as imposing monuments to the Reformation. Rural in character, South Ayrshire features one of Southern Scotland’s best-loved visitor attractions; Culzean Castle stands on a cliff top and was built in the 18th Century. It’s set in a large and attractive country park, with far-reaching views of the sublime Ayrshire coast. Alloway, a suburb of Ayr, is linked to Scotland’s national poet Robert Burns, who was born in a cottage here in 1759. The building remains intact and holds a museum covering the Burns’ childhood. For some of Scotland’s most atmospheric ruins, see 13th-Century Crossraguel Abbey, near Maybole. Southeast of Glasgow, South Lanarkshire would be a convenient choice for a fairytale wedding destination. The landscape is of gentle green hills used for grazing, and there are plenty of fascinating things to see. New Lanark is a UNESCO World Heritage Site thanks to its late-18th Century cotton mills powered by waterfalls on the River Clyde. There are several castles in the countryside, including Craignethan, constructed in the 1500s as an artillery fortification on elevated ground ground next to a meander in the Nethan River. The natural and man-made beauty of this setting make it popular for weddings. With historic cities and towns in the southeast, and large unpopulated expanses in the north, Stirling has much to offer. The eponymous city has a castle held as one of the best preserved in the country. Another key sight is the Wallace Monument commemorating the 13th Century historical figure. In the north is romantic highland scenery, woven with the iconic long and narrow lochs. On the western side of Loch Tay are the beautiful Falls of Dochart. A fine way to witness the wilderness is on the West Highland Way, which courses through the area. Northwest of Glasgow’s suburbs, West Dunbartonshire has several commuter towns, but also lots to recommend it as a wedding location. This area is on the River Clyde, which forms the southern boundary, while the north-western corner is on the shore of Loch Lomond. The Kilpatrick Hills are stunning, formed of 340 million year-old lava flows and containing ancient cairns from the Bronze Age. But it is Loch Lomond that is the undoubted highlight - a freshwater lake enclosed by low hills clad with heather, oaks and pines. The main town of West Lothian is the very modern Livingston, with its own airport, first class shopping and new town infrastructure. The county borders the City of Edinburgh, North and South Lanarkshire, Falkirk and the Scottish Borders. There are still a number of traditional villages in West Lothian although many set in beautiful rural countryside. Off the north-western coast of Wales, Anglesey is the largest island in the Irish Sea. The interior is quaint and rural, known for its meandering lanes and picturesque villages. On the coast it can be wild and spectacular, with UNESCO-listed landmarks like Beaumaris Castle, built by King Edward I in the late-13th Century. The island is separated from mainland Wales by the Menai Strait, and at Llanfairpwllgwyngyll you can visit Plas Newydd, a national trust country house belonging to the Marquess of Anglesey, with views out over the water. This county has a coastline dotted with picturesque fishing villages and a hilly interior made up of forest and rivers like the Towy. Carmarthenshire is also a county of spectacular castles, like Carreg Cennen in Trapp or Dinefwr near Llandeilo, which is within a deer park and offers sumptuous rural views. Black Mountain is a range within the Brecon Becons, to the east of Carmarthenshire, and has some truly remarkable rock formations to see. The coast is a big attraction, with beaches like Cefn Sidan, a seemingly endless stretch of fine sand, fringed by dunes. A coastal county in Mid Wales, Ceredigion is sparsely populated and packed with natural beauty. To the east are the Cambrian Mountains where the well-known Wye and Severn Rivers have their source at Plynlimon. The Hafod Estate is a landscaped former hunting lodge in the Ystwyth Valley, celebrated for centuries for its beguiling scenery of hills, woodland and green riverbanks - surely one of the most romantic places in the UK to tie the knot. On Ceredigion’s 50-mile coast are five Blue Flag beaches one of the only permanent places where you can see bottlenose dolphins in summer. As popular for its seaside resorts as its formidable inland mountain scenery, Conwy has much to offer. On the Irish Sea is Llandudno, which has preserved its dignified Victorian architecture and character. Conwy the town is equally recommended, but for the medieval heritage that has earned it UNESCO status. The original town walls are still intact and there’s a walkway that visitors can follow. The county also falls within the Snowdonia National Park, and the village of Betws y Coed is the gateway to one of the UK’s highest and most impressive mountain ranges. This is a long, narrow county in North Wales, which has a short coastline on its upper tip and large areas of unblemished moorland to the south. Prestatyn is a pretty seaside resort, with a beach that has been awarded the Blue Flag. As you venture south the landscape becomes more dramatic - Llangollen on the River Dee is a charming town on the fringe of the Berwyn Mountains. A feat of engineering to check out is the UNESCO-listed Pontcysyllte Aqueduct, which channels the Ellesmere Canal over the Dee and was completed in 1805. Set in Wales’ far northeast corner, Flintshire is a county recognised for centuries for its industry, which remains today in the form of manufacturing plants. It’s also where the River Dee, the source of which is in Snowdonia, discharges into the Irish Sea. The town of Mold is attractive, with a church from the 1400s and a street market held on Wednesdays and Saturdays, known for the high quality of its fresh produce. Wales’ most densely populated region, Glamorgan features Cardiff and Swansea, the country’s first and second cities. For inspiring landscapes head west for the Swansea Bay or the Gower Peninsula, where there’s an Area of Outstanding Natural Beauty, with cliffs, deserted sandy beaches and castles from the Middle Ages. Cardiff is the cultural centre, with a wealth of choices for dining and entertainment. The top monument here is the city’s Castle, which is a large fortified complex blending lots of different architectural styles and dating back to Roman times. With much of its area falling within Snowdonia National Park, this is a particularly scenic part of Wales. The park is revered for its almost Alpine landscapes of tall peaks, waterfalls, ridges, lakes and glens, as well as incredibly varied birdlife. At just over 1000 metres Mount Snowdon is the highest peak in Wales and the summit can be reached via the Snowdon Mountain Railway, a rack and pinion steam railway that has been running since the 19th Century. For a coastal backdrop for your wedding, Llyn is a land of sweeping sandy beaches and majestic headlands. Set in southeast Wales, this county is visited for its bucolic farmland and historical monuments, especially castles. Tintern in the Wye Valley is gorgeous, and home to the preserved ruins of a 12th-Century Cistercian abbey that was destroyed in the Reformation. There are also a number of stately homes and gardens to see, perhaps best represented by 17th Century Tredegar House, which lies within 90 acres of parkland, including an ornamental lake. The western side of the county is hillier, and part of the Brecon Beacons National Park, drawing walkers and mountain bikers from all over the UK. On Wales’ southwestern tip, this county’s entire coastline is made up of the Pembrokeshire Coast National Park. It’s an unspoiled and picture perfect place to tie the knot, with towering cliffs, isolated offshore islands, home to untouched sandy beaches. There’s abundant wildlife in the park - many visitors take boat trips to the offshore islands to see seabird and seal colonies up close. The towns are also stunning; Tenby is a walled seaside resort with a warren of cobblestone streets, while St David’s is the UK’s smallest city and its 12th-Centruy cathedral is one of Wales’ most important religious buildings. Covering much of central and eastern Wales, this county boasts a wide variety of landscapes and cultural attractions. In the south are the arresting tall hills of the Brecon Beacons, with scenery apt for fairytale weddings. Welsh Mountain Ponies wander the range, and there are a host of spectacular natural landmarks that include waterfalls and caves. Further north the countryside is a little more gentle, but no less beautiful. The Elan Valley for instance is popular with cyclists for its green hills and lakes. An area of northeast Wales centred on the town of the same name, Wrexham sits between Wales’ famous hills and the Dee Valley, which marks the boundary with England. The town of Wrexham was an important hub for Wales’ mining industry, which has slowly been replaced by manufacturing. For heritage head to Erddig Hall, a handsome 17th-Century country house in elegant grounds or the imposing Chirk Castle from the late-13th Century. Find out more about getting married in the United Kindom in our UK Wedding Guide or browse our UK Wedding Directory to start planning your dream wedding.